The world's linguistic diversity is diminishing, with more than two hundred languages declared extinct and thousands more endangered. As these languages disappear, deep stores of knowledge and cultural memory are also lost. The scholarly significance of these endangered and extinct languages and literacies provides the impetus for this collaborative initiative supported by the Andrew W. Mellon Foundation. 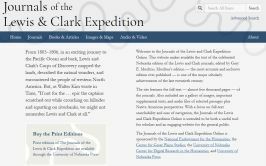 Sponsored by the National Endowment for the Humanities, the Center for Great Plains Studies, the University of Nebraska Center for Digital Research in the Humanities, and the University of Nebraska Press, the Journals of the Lewis and Clark Expedition Online Project makes available the text of Gary E. Moulton’s celebrated edition of the Lewis and Clark journals. The Digital Commons@University of Nebraska–Lincoln repository is a collaborative service of the University of Nebraska-Lincoln libraries. Faculty, researchers, and students associated with the University of Nebraska-Lincoln are invited to deposit digital materials for long-term preservation and world-wide electronic accessibility. 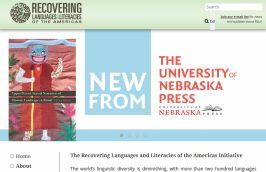 The University of Nebraska Press collection contains sample books and chapters that can be read online or downloaded. 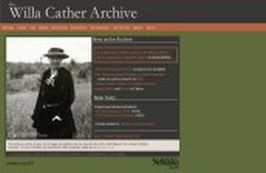 The Willa Cather Archive is an ambitious endeavor to create a rich, useful, and widely-accessible site for the study of Willa Cather's life and writings. The Archive is a product of a partnership between the Archives and Special Collections, University of Nebraska-Lincoln Libraries, University of Nebraska–Lincoln Center for Digital Research in the Humanities, The University of Nebraska Press, and the Cather Project at the University of Nebraska. Early American Places focuses on the history of North America from contact to the Mexican War, locating historical developments in the specific places where they occurred and were contested. Though these developments often involved far-flung parts of the world, they were experienced in particular communities—the local places where people lived, worked, and made sense of their changing worlds. 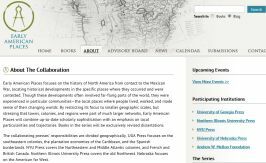 By restricting its focus to smaller geographic scales, but stressing that towns, colonies, and regions were part of much larger networks, Early American Places will combine up-to-date scholarly sophistication with an emphasis on local particularities and trajectories. Books in the series will be exclusively revised dissertations.